Once upon a time I tried a Green Tea Latte from Starbucks. I wasn't a huge fan. It tasted too earthy. Too green. One of the primary ingredients was matcha powder. So, when I received a big package of matcha in my goodie bag from the #TIUVegas meetup a couple weeks ago, I wasn't sure I'd like/use it. I took a shot and experimented with it in a smoothie. The other secret ingredients that made this smoothie super delicious were the cinnamon, ginger, and vanilla protein powder. Oh, and the apple juice. These ingredients really helped make the smoothie delectable. 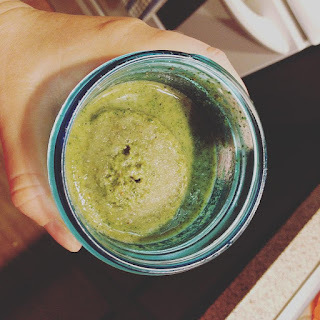 Blend kale and almond milk together. Divide equally into mason jars. Drink one immediately and freeze or refrigerate the other 3 to enjoy throughout the week. I'm linking up today with Deborah and Sarah for Meatless Mondays. Thanks, Deborah! I hope you give this one a try. It was seriously so delicious.